If you’re looking for a set of headphones specifically for monitoring, Tascam thinks that it has the solution in the form of its new TH-07 cans. Intended to “duplicate the audio quality of high-end near field monitors,” these headphones promise full but natural bass, a flat mid-range and clarity at the top end. They’re said to be suitable for mixing, monitoring and other high-end audio applications. Spec-wise, your get 50mm drivers and a frequency response from 10Hz to 30kHz. Sensitivity is 100 dB ±3 dB, while the closed-back design should help with bass response and block out external noise. 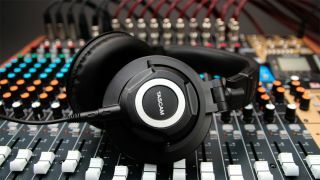 These being mixing headphones, Tascam has tried to ensure that they’re comfortable to wear for long periods at a time, while the earcups can be rotated and angled for easy one-ear monitoring. You get two detachable cables - one coiled and short, the other long and straight - as well as a leather bag that can be used for transportation. We’re still waiting on a price and release date, but you can find out more on the Tascam website.